Bryce Harper donned the red pinstripes for the first time on Saturday. CLEARWATER, Fla. -- Bryce Harper stood atop the third-base dugout Saturday afternoon, reached his arms through the sleeves of a Phillies jersey, and tugged the brim of his red hat. This felt like the moment an entire city had longed to see for months. 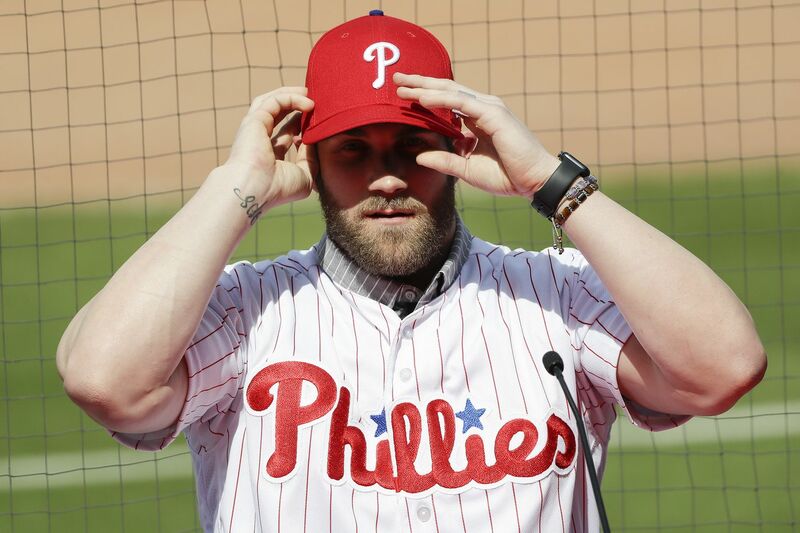 Bryce Harper, after choosing to play in Philadelphia, was wearing a Phillies uniform. It was finally official. And if Harper has his way, those will be the colors he wears for the rest of his career. Harper’s mega-deal does not include a clause to allow him to opt-out and become a free agent. His 13-year, $330 million contract will keep him in Philadelphia until he is 39 years old. Harper said he began his anticipated free agency with one simple request of his agent, Scott Boras. He did not want an opt-out. Harper made it clear Saturday that he wants to win in Philadelphia. He also made it possible in his contract for the team to keep trying to win, too. Harper’s deal is the richest in the history of American team sports and it was the finishing touch on an offseason that saw the Phillies add roughly $440 million in player salary. But the contract was creatively constructed to not limit the Phillies in future offseasons. By extending the deal to 13 seasons, Harper’s average-annual value lowered to $25.38 million, the figure calculated each year toward baseball’s competitive-balance tax. Harper’s salary is not enough to handcuff the Phillies from being busy again. And Boras said Harper wants to recruit players to the Phillies. General manager Matt Klentak helps Harper put his new jersey on as Harper's agent, Scott Boras, watches. The guy who “comes off the books” sure sounded like a reference to Mike Trout, the Eagles season-ticket holder who spends his summers as the best player in baseball. If the Angels fail to sign Trout to an extension and he hits free agency after the 2020 season, the Phillies will put on a full-court press in an effort to become baseball’s Golden State Warriors, assembling a group of star players who jockeyed to play together. General manager Matt Klentak said he never wants to go into an offseason without flexibility. You “just don’t know what’s around the corner in terms of a team need or an opportunity to add a player,” he said. The Phillies, Klentak said, found a way to maintain that flexibility even when adding a superstar on a record-setting contract. Middleton was a Phillies fan when they signed Pete Rose and owned a stake in the franchise when he was one of the driving forces for the Phillies to sign Jim Thome and Cliff Lee. Middleton, better than anyone else who sat on the dais at Saturday’s news conference, knew what that moment meant to a city when Harper pulled on that jersey.